James Gregory was born on November 6, 1638 in Drumoak, Scotland. His father was a minister and died when Gregory was thirteen. His mother, whose uncle was a professor of mathematics, schooled the boy in geometry and had him attend grammar school in Aberdeen, Scotland. With his father dead, his education was seen to by his older brother David and he attended Marischal College in Aberdeen, graduating in 1657. 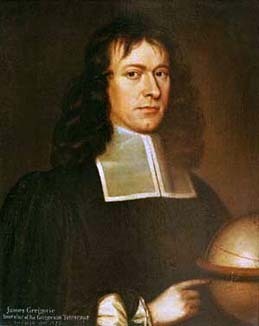 Gregory studied optics and in 1663 published Optica Promota in which he described for the first time the construction of a reflecting telescope, also called a Gregorian telescope, honoring Gregory. He was not able to construct one because he did not have the skills required to prepare the mirrors. A reflecting telescope is an optical telescope that uses one or more curved mirrors to reflect light from the object being viewed. It was invented as an alternative to a refracting telescope, in which light passes through lenses. Refracting telescopes suffer from the problem of chromatic aberration, in which, due to the fact that different colors of light have different indices of refraction through glass, some details can be blurry and show color blotches. An index of refraction is the ratio of the speed of light through a vacuum over the speed of light through a particular medium, in this case glass, and can used to determine how far a light beam is bent when it travels through one medium to another. The effect of the differences in the indices of refraction is that different colors will have different focal lengths for a particular telescope. Today nearly all large research-grade telescopes are reflecting telescopes. Without lenses, they do not suffer from chromatic aberration and have a wider spectrum of color, due to the fact that some wavelengths of light (particularly UV light) are absorbed by glass lenses. Another advantage of reflecting telescopes is that they can be made larger than refracting telescopes. The largest lens that can be practically created is only 1 meter in diameter, whereas reflecting telescope mirrors have been created that exceed 10 meters in diameter. In 1663 Gregory went to London, England where he met some members of the Royal Society, including John Collins, Robert Hooke, and Sir Robert Moray. These friends introduced him to an optician named Rieve, who attempted to construct a telescope using Gregory's design, but he was unable to make the parabolic mirror to work to Gregory's satisfaction. Isaac Newton read Gregory's book and the two later corresponded. At that time the European continent was considered the center of mathematics research so in 1664 he left London for Padua, in the Venetian Republic, where he studied mathematics and published two works on proto-calculus, which bolstered his reputation and got him into the Royal Society when he returned to London in 1668. In 1669, with the help of Robert Hooke, he was appointed to a new chair in mathematics at the University of St. Andrews. He taught at St. Andrews for 6 years but did not enjoy his time there. Suspicious of his new ideas and his interest in higher mathematics his masters at the school shunned him and eventually withheld his salary and servants. In 1674 he accepted a new professorship at the University of Edinburgh. At Edinburgh the university officials were more generous and he had the money he needed to establish an astronomy program. Sadly, in October of 1675 he suffered a stroke while he was showing the moons of Jupiter to his students. He died a few days later at the age of 37.